UPCOMING EVENTS: Sustainable Agriculture: NOFA Winter Conferences, NFCA Annual Meeting, Supporting Start-Ups & More! Imagine you are a poor mill worker in the north of England in the mid 1800s. The Industrial Revolution has made production more profitable, but it has also cost skilled artisans their jobs and concentrated wealth and control among a small group of factory owners. Many in the community are unemployed, while others don’t make enough to afford basic groceries. What would you do to provide healthy food for your family? How might you work with your neighbors to improve the lives of people in your community? On December 21, 1844, after years of organizing and experimentation, a group of weavers, workers and community activists opened a modest grocery store on Toad Lane in Rochdale, England. Their goal was to provide basic goods members such as butter, flour, oatmeal and candles. Their vision, however, was nothing short of a transformation of the food system and economy. At a time when access to nutritious food was limited and adulterated products were common, the Pioneers saw an urgent need for an alternative. The co-operative movement that they helped launch now includes over a billion members and operates in nearly every sector of the economy. From food co-ops to farmer co-ops, worker co-ops to credit unions, co-operative enterprise has empowered people around the world to have more control over their lives and communities. Today, the results of the global recession have dramatically affected the ability of people to provide themselves and their families with healthy food. In the U.S., 23.5 million Americans (including 6.5 million children) live in areas with limited access to affordable and nutritious food, particularly in low-income neighborhoods and communities. In New England, the relative cost of high-nutrition less processed foods is among the highest in the country, when compared to low-nutrition, highly processed foods. Additionally, childhood obesity rates are higher in many parts of the region than the national average. In this context, it may come as no surprise that people are again turning to co-operative enterprise for solutions. Food co-ops in New England have been pioneers and innovators in food security. Some date back to the Great Depression, while others were founded in the 1970s and 80s, emerging as community-based responses to limited access to healthy, affordable food. In recent years, a new wave of food co-ops has emerged, reflecting growing interest in local foods and democratic ownership. Rooted in their communities, co-operative enterprises are an effective tool for building healthy food access, stable markets for local producers, and sustainable jobs. As food security has again emerged as an urgent issue in our region, the Neighboring Food Co-op Association (NFCA) has been working to develop solutions that balance financial sustainability with offering healthy affordable food, supporting local economies, and building fair relationships with workers and producers. In collaboration with the New England Farmers Union, Cooperative Fund of New England, and Hunger Free Vermont, the member co-ops of the NFCA are sharing what they have learned from “healthy food access” programs already in place, and supporting their neighboring food co-ops to roll out these programs and create new approaches to make healthy food and member-ownership more accessible. In 2014 alone, six food co-ops have implemented new “Food For All” programs, offering community members with limited income access to co-op member-ownership and discounts on their groceries every time they shop. In their day, the Rochdale Pioneers saw a solution to their challenges in economic empowerment through democratically governed, community-owned businesses (co-ops). As we gather to celebrate the holidays together, our Neighboring Food Co-ops are reaching back to their roots, building on a legacy of food security as we move forward together, continuing to use the co-op business model to find solutions to the challenges of our time. To learn more about the Neighboring Food Co-op Association’s Healthy Food Access work, visit: www.nfca.coop/healthyfoodaccess. Though the Monadnock Food Co-op has been open for less than three years, the co-op’s customer and sales numbers are steadily growing, and it has already had an impressive impact in its community: growing jobs, building relationships with local farmers, and exposing more people to local, healthy food. The Keene Sentinel covered some of the impacts of the co-op’s growth in a recent article. Beyond employees benefiting, local farmers and producers are benefitting from having a year-round market to sell and help them market and promote their products. According to the Co-op’s annual report, total sales exceeded $8.5 million in 2015, a growth of 32 percent over the prior year. Of that, roughly a third comes from local farms and producers, Faber said. Since the co-op opened its doors, the number of local farmers and producers selling to the co-op has increased from about 155 to 250. FARM TO FREEZER IS BACK! A couple years ago, we featured some regional frozen vegetables in our freezers in Aisle 4. These were offered to us as part of the Neighboring Food Co-op Association’s Farm to Freezer program, and we’re happy to announce that NFCA is once again making these delicious frozen veggies available to us! NFCA’s Farm to Freezer program started in response to Co-ops in New England needing more local or regional vegetables and fruit in our freezer aisles. We offer a wide variety of local and regional options in our fresh food departments, like Produce, Meat and Seafood, and Cheese, so it felt only natural that a larger share of our frozen items should be produced locally or regionally as well. We have a variety of locally grown and frozen berries from Adam’s Berry Farm in Charlotte, VT, but the vegetable options were lacking. Enter Farm to Freezer! The first year of the Farm to Freezer project was 2012, and that first year helped identify potential partners, processes, and opportunities. During the second year, NFCA worked to expand the range of products and the length of time they would be available to customers during the fall and winter season. NFCA put the project on hold in 2014 to work with New England Farmers Union and Deep Root Organic Co-op to find ways to improve distribution and to support more collaboration. They were able to relaunch the project this year due to a new partnership with the regional distributor Associated Buyers, which will help get products to NFCA’s member Co-ops. So now, you’ll be able to find organic broccoli, organic green beans, and non-GMO sweet corn, all grown, processed, and packaged right here in the Northeast. We’ll also be getting frozen blueberries as soon as they are available. The organic broccoli is grown by Hepworth Farms in Milton, NY, a seventh generation farm. The farm produces over 400 varieties of organic vegetables! The organic green beans are grown by Martin and Christa Stosiek of Markristo Farm in Hillsdale, NY. They are committed to healthy food systems and sustainable agriculture. 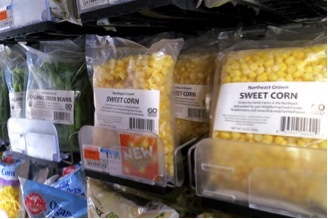 The non-GMO sweet corn is grown by John Altobelli of Altobelli Farm in Columbia County, NY. This is a third generation farm and John has been farming the land for over 30 years using minimum tillage, drip irrigation, cover cropping, and no chemical fertilizers or pesticides. The blueberries are the highbush variety grown by Greig Farm in Red Hook, NY. Greig Farm has been in operation for over 60 years, and they use Integrated Pest Management (IPM) to manage their blueberry bushes. This is great timing for the relaunch of the Farm to Freezer project, as the holidays are just around the corner. As fall starts to set in and winter is peeking around the corner, I’m looking forward to using these fresh frozen veggies in all sorts of dishes to help remind me of warmer days. Need some ideas of how to use these items? Broccoli, green beans, and corn can be briefly steamed in the microwave and then added to stir-fries or soups near the end of cooking. Give the broccoli a whirl in fried rice or pho, or add some to your morning omelet. Try the green beans in the classic green bean casserole, and dress up the sweet corn by sautéing it with butter and some herbs as a side dish, or try adding it to risotto to add a nice crunch to complement the risotto’s creaminess. Come up with a delicious recipe using Farm to Freezer products? Let us know by sharing on our Facebook page! Have you noticed the “Cave to Co-op” signs in the cheese section of your local food co-op? The project is a partnership between Provisions International and the Neighboring Food Co-op Association (NFCA) to support artisanal cheese producers in our region and make their products more easily available to co-op shoppers. Each month, a delicious local cheese is featured at a great price. December’s “Cave to Co-op” special artisan cheese is “West West Blue” from Parish Hill Creamery, Westminster West, VT. Parish Hill Creamery produces seasonal, hand made, raw milk cheeses inspired by the traditional cheeses of Italy. They make cheese traditionally, simply, as near to home as possible. West West Blue is a traditional, two-curd Gorgonzola, made with whole, raw milk from Elm Lea Farm. For more information on the program, please visit www.nfca.coop/CaveToCo-op. During the holiday season, we follow traditions that keep important celebrations alive. As we prepare meals and break bread with family and friends, we can also remember to thank the people who grow the abundant food for our tables, and support policies and programs that will help them to continue to increase their productivity. As you consider your year-end giving, we hope you will consider becoming a friend of our region’s farmers and fishermen by joining the New England Farmers Union or making a special contribution to our programs. Our nation’s two million family farmers and ranchers provide the bounty that many Americans have come to consider a birthright. These farmers, on average, feed 155 people each while supporting 24 million jobs in the United States. But world population is growing quickly and they will need to produce more, much more, in the future. In fact, in order to feed the world’s rapidly growing population, farmers will have to raise more food in the next 50 years than has been raised in the last 10,000 years combined. In this country and around the world, the foundation of our food system is the family farm, a proven model for stability, sustainability and productivity. Because the family farm model represents 98 percent of all farming households worldwide, the key to feeding the global population is to provide a fair playing field for family farmers and ranchers. We can also advocate for policies that promote co-operative development, enabling producers to achieve the scale needed to meet growing global demand while supporting local ownership and control. One of the greatest challenges we face today is identifying and training new and beginning farmers who can take over for those who will soon be retiring. The Farmers Union’s Beginning Farmer Institute is an example of how we are working together to support the next generation of farmers. If you believe in family farming and want to support a more vibrant and sustainable regional food system, please consider becoming a member of New England Farmers Union at www.newenglandfarmersunion.org. We advocate for policies and programs that ensure the next generation of farmers and fishermen will be raising food for your table — and your grandchildren’s table. The Neighboring Food Co-op Association (NFCA) is an affiliate member of the New England Farmers Union (NEFU), representing our commitment to collaboration among consumers and our region’s family farmers and fishermen to influence food system policy and build a more vibrant, resilient and co-operative food system in New England. NFCA Executive Director Erbin Crowell serves as Vice President of NEFU, and many of our Neighboring Food Co-ops are organizational members. For more information on our partnership and how you can become a member, please visit: www.newenglandfarmersunion.org/co-operation. Hosted by the Neighboring Food Co-op Association in Amherst, MA.